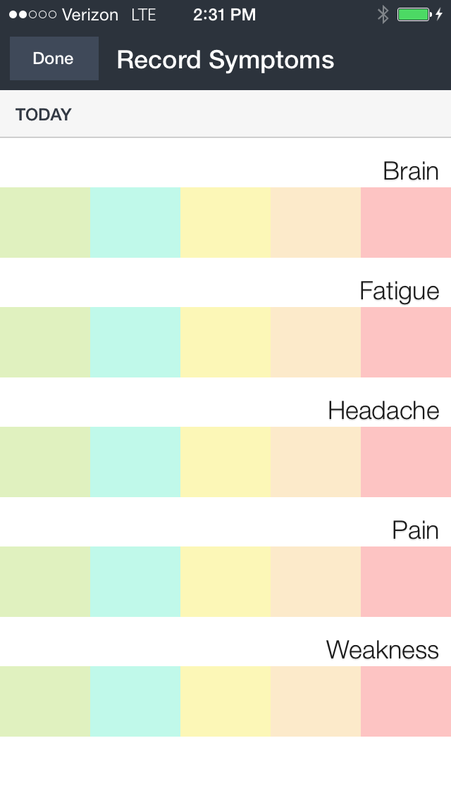 The TL;DR version of this is that if you’re looking for any sort of phone app to track symptoms, for any illness, I very highly recommend Symple. In the interest of disclosure, these folks aren’t paying me anything. I just find it immensely helpful. I work in design, and I’ve had Lyme Disease for about 15 years. So intersections of tech and healthcare are always really interesting to me. This one isn’t just interesting to me on a theoretical level, though, it’s been really essential to my healthcare, on a personal level, since I found it about two years ago. As mentioned, I’ve been sick a long time. My particular illness has a pretty subjective treatment plan. When you have something like diabetes, you can get your bloodwork done, check your numbers, and adjust accordingly. With Lyme, all my doctor really has to go on is how I say I’m doing. (This is also common with mental health issues like anxiety, or with migraines, or any number of illnesses where there isn’t a simple blood test you can take to monitor how you’re doing.) At times, it’s difficult to be objective about it, and there’s a tendency to project how you’re feeling that day onto how you’ve been feeling in general, especially when you’re in a lot of pain. So having a system where you can log that information every day can go a long way toward improving your quality of care. I tried a ton of systems – native apps, websites, good old pen and paper – and I found problems with all of them. Every digital system I found was hard to use, overly complicated, and difficult to customize. Pen and paper meant still having to type everything in somewhere to do anything with the data. When you have something you’re doing every single day, you really need to minimize the barriers to getting it done. Everything I tried felt like a chore, and I never stuck to them. Symple is aptly named, and incredibly flexible. It’s my little holy grail of tracker apps. 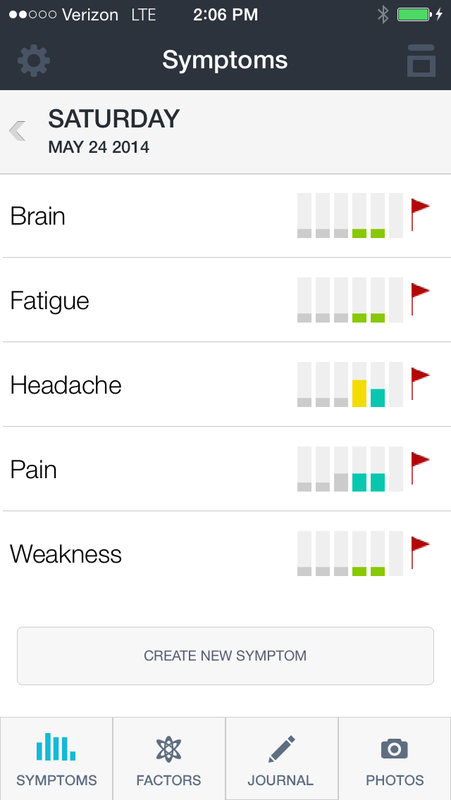 I can’t recall if there’s a limit to the symptoms that you can track at any time; I opted to group mine into larger symptom sets because it was easier for me. If at some point you don’t want to track that particular thing anymore, you can pause it – the data is saved, but it no longer prompts you to put in a value for it every day. Once you’ve got them entered, you just have to log them on a scale from 1 to 5. This takes me all of 2 seconds. Five gives you enough range to be a useful marker, without getting so specific that it takes more than a few seconds to log your stuff. I used to have mine on a 1 to 10 scale, and spent entirely too long deciding exactly where I was that day. It’s basic as hell, which is perfect for this sort of thing. In addition to your symptoms, you can add something called factors. It’s incredibly easy to customize, and these types of apps should be. Illness doesn’t affect everyone in exactly the same way – even when it’s the same illness. There’s also a journal option, where you can make whatever notes you need to. I typically use it for things that don’t come up often enough to bother making a factor of, but again, you can put anything you want in there, it’s just a simple text field. 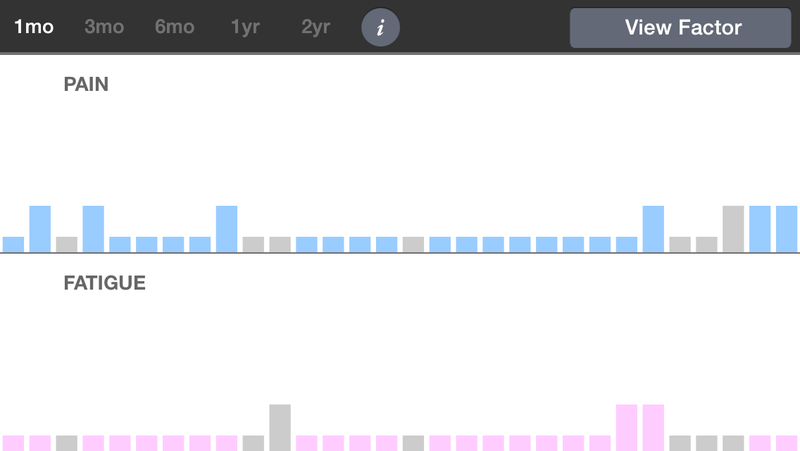 While you have the symptom view up, if you rotate your phone to landscape, it’ll change to a bar graph where you can view different symptoms over time. This is nice, but not quite as in-depth an analysis as I’m looking for. 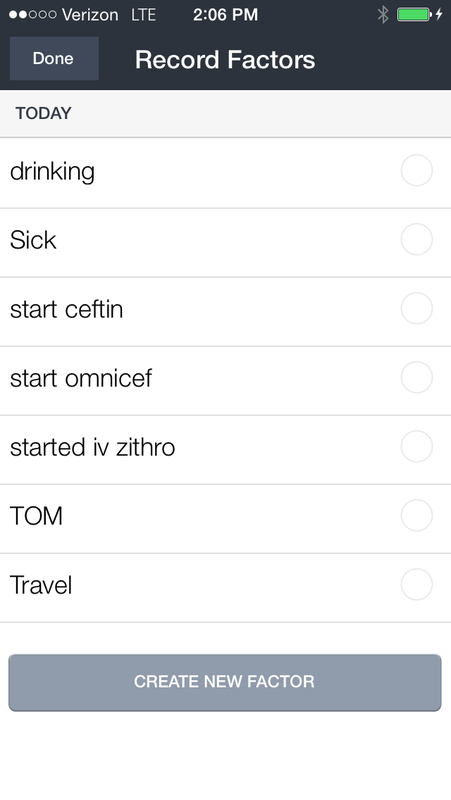 But Symple has that covered – you can export to a .csv. YOU CAN EXPORT TO A .CSV! If you’re thinking “what’s a .csv?” then this isn’t going to be a super helpful feature to you. But if you love Excel spreadsheets like I do, you can take all of this incredibly useful data the app collects, and you can organize it however you want. I set mine up so that I can see averages for each symptom week to week, or month to month, and an overall average for both. It’s color coded, because of course it is. But like everything that Symple does in-app, they give you a basic structure that you can customize in whatever way you find most useful. They didn’t get caught up with unnecessary bells and whistles, which can be such a hard thing to avoid when designing apps. And the most important thing about any tracker app is that you actually use it (healthcare folks like to use the word “compliance” for this, but my punk kid background makes me cringe at that). No matter how many cool infographics an app can spit back out at you, if you aren’t logging your information, then it’s failed. This is so easy to use, they’ve really eliminated any barrier – it’ll even remind you at a set time every day to log your symptoms. 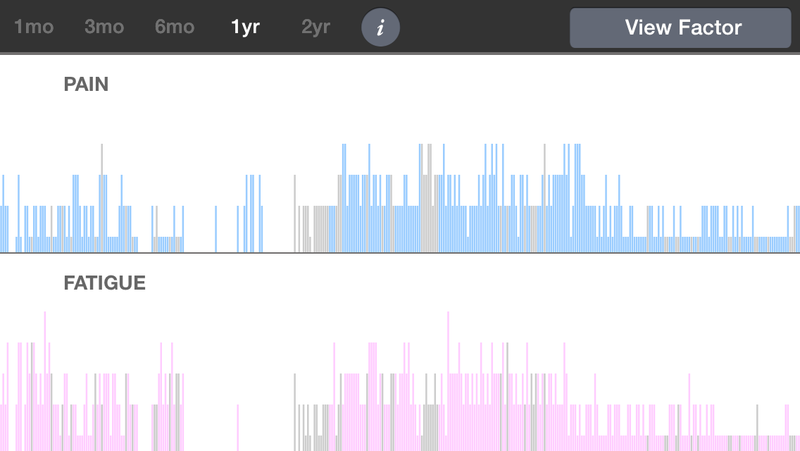 I’ve been using it every day for two years, and I spent 13 years being incredibly undisciplined in tracking anything. Now when my doctor asks me how I’m doing, I have objective data to give him. 0.5 better than last month. You can download Symple from the app store, see their website and follow them on on twitter. …And isn’t available for Android, noooooo!! Oh no! Maybe send them an email, they can add it to the “people asking for Android” list and maybe they’ll bump that up the dev priority. Thanks for this detailed description – I’ve been looking for an app to track my MS symptoms and this sounds right up my street. I love excel files too – so the CSV export is great.